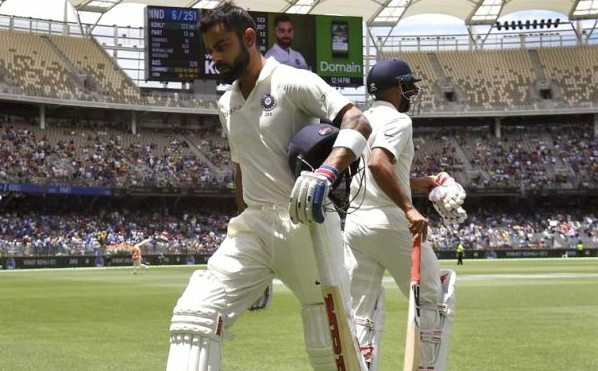 ONI Bureau: Team India is struggling to save Perth Test, but a loss looks imminent after the team ended Day 4 at 112/5 while chasing a victory target of 287. Lokesh Rahul, Murali Vijay, Cheteshwar Pujara, Virat Kohli and Ajinkya Rahane are already back to the pavilion shattering Indian dream of a fightback. Earlier, Australia bowled out for 243 in the second innings, setting a victory target of 287. Usman Khawaja was the top scorer with 72, while Tim Paine made 37. Shami took 6 wickets for India, while Bumrah claimed 3. In the second innings, Murali Vijay made 20, while Rahane scored 30. Hanuma Vihari is batting on 24, while Rishabh Pant is on 9. Hazelewood and Lyon have taken two wickets each.